It wouldn’t be Thanksgiving without dressing. It’s my favorite part. And, since I’m a Southern girl, it’s all about the cornbread dressing for me. This is the recipe my mother makes. Every year, she makes it without measuring her ingredients. She just does it. So during our pre-Thanksgiving dinner, I *made* her measure everything. I’m so happy to now have a written recipe of her amazing dressing! Bake the cornbread according to package instructions. Cool. (This can be done the day before serving). Melt the butter over medium-high heat and sautee the onion and bell pepper until the onion is translucent and the bell pepper is soft. 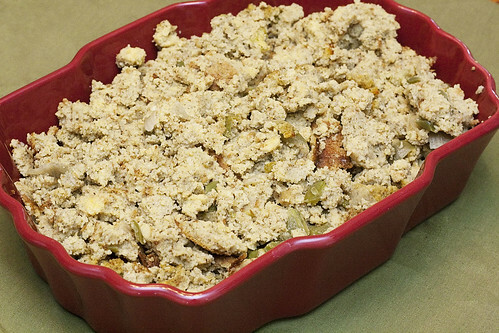 In a large mixing bowl, crumble the cornbread into small pieces and add the sage and poultry seasoning. Pour the chicken broth over the cornbread and seasoning and stir to combine. Add the onions and bell pepper, then mix with a large spoon. Stir in the eggs and salt, making sure the cornbread is moist and the seasoning is distributed throughout the mixture. Pour into a large cake pan and bake for 50-55 minutes until the top is golden brown and a toothpick inserted in the center comes out clean. 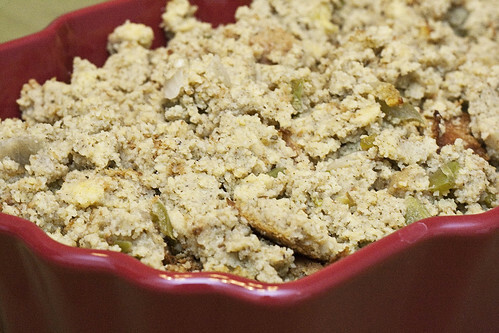 Cornbread Dressing…just like my momma makes it! It’s not Thanksgiving without this side dish on the table!